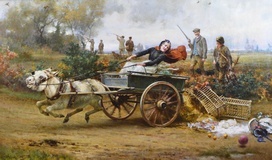 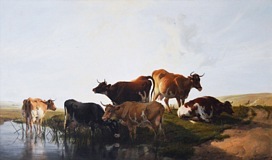 Alfred Duke was an animal and sporting painter believed to have been born in Lancashire around 1863. 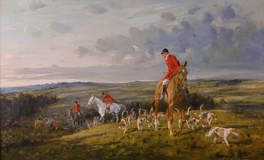 He spent most of his life in Manchester and exhibited regularly at the Manchester City Art Gallery. 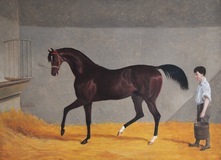 He also exhibited at the Royal Society of Artists, Birmingham and the Walker Art Gallery, Liverpool. 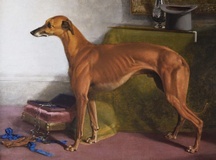 The Victorian era was an age of dog portraits, made popular by Queen Victoria. 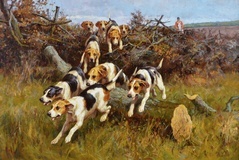 The obsession of the ruling classes with field sports led to a demand for artists such as Duke who was one of a band of painters celebrating sporting dogs. 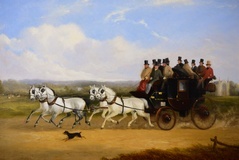 He was influenced by his contemporaries such as Thomas Blinks and George Derville Rowlandson. 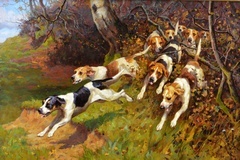 Duke’s works are beautifully painted and show an excellent understanding of the animation and movement of dogs. 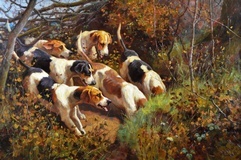 Examples of his work can be found at Towneley Hall Art Gallery & Museum and Turton Tower. 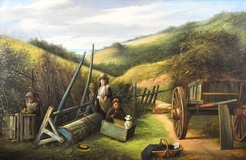 The painting is housed in a new, English made gilt frame which is in excellent condition.